THE NOW UBIQUITOUS TACO came late to the lineup of New Mexican cuisine. The corn tortilla, of course, is among the oldest foods of this region, a staple of the Puebloan people that preceded the arrival of the Spanish. Among the tortilla’s attributes was its ability to serve as an edible scoop for meat or beans. From this elementary use, though, it took a while for an oil-softened or fried tortilla wrapped around a filling to be recognized by name. Early-20th-century, post-statehood New Mexican cookbooks promoted posole, chile, pinto beans, tamales, enchiladas, chiles rellenos, and carne adovada. But no, not a single taco. We weren’t lagging terribly behind the taco originators of old Mexico. “Taco” didn’t appear in print as a food reference in Mexico until the late 19th century, according to Jeffrey Pilcher, author of Planet Taco: A Global History of Mexican Food. In the years before tacos made an appearance in New Mexican cookbooks, I am certain that people stuffed tortillas in some fashion with local mutton or goat meat. Our cookbooks of the 1930s and ’40s document the taco, in several variations, generally made with ground beef, often with potato mixed in—a combination that tastes sublime, by the way, when made well. It has been common to season the meat with some of our chile, either red or green, ground for the former and chopped for the latter, or with a chile sauce made from either color of pungent pod. Las Vegas native Margaret C de Baca Martinez, daughter of the second governor of the state and a home economics teacher, penned a 1939 cookbook with perhaps the first printed recipe for New Mexico tacos. Hers include a meat-and-potato filling similar to that found in our recipe, but she added red chile sauce inside the folded soft tacos, as well as more red chile and cheese on top. The author recommended serving them with beans, calabacitas, and “canned pineapple with bizcochitos” for dessert. The 1941 El Plato Sabroso Recipes, from restaurateur Eloisa Delgado de Stewart, featured tacos that were rolled rather than folded. She specified using white corn tortillas (tortillas de nixtamal blanca), dipped in hot fat. Once softened, the tortillas were wrapped around a beef-and-pork filling with onion and celery, then topped with lettuce and cheese. She mentioned the option of pouring chile sauce over the whole shebang, if one wished. New Mexico can claim one standout role in taco history, well recognized among food historians if not among the general rank and file. It should be regarded as the taco equivalent of “the shot heard ’round the world.” Fabiola Cabeza de Baca Gilbert, another home economist, in her 1949 book The Good Life, was the first to include a recipe that featured crispy hard-shell tacos. In 1979, Lucy Delgado may have made the first New Mexico cookbook reference to store-bought “taco shells,” in her Comidas de New Mexico. Delgado, a much-admired Santa Fe cook and hostess, also mentioned using the beef-and-potato filling for fried rolled taquitos. She also included a “taco sauce” recipe similar to the Norteño Salsa in our recipes. 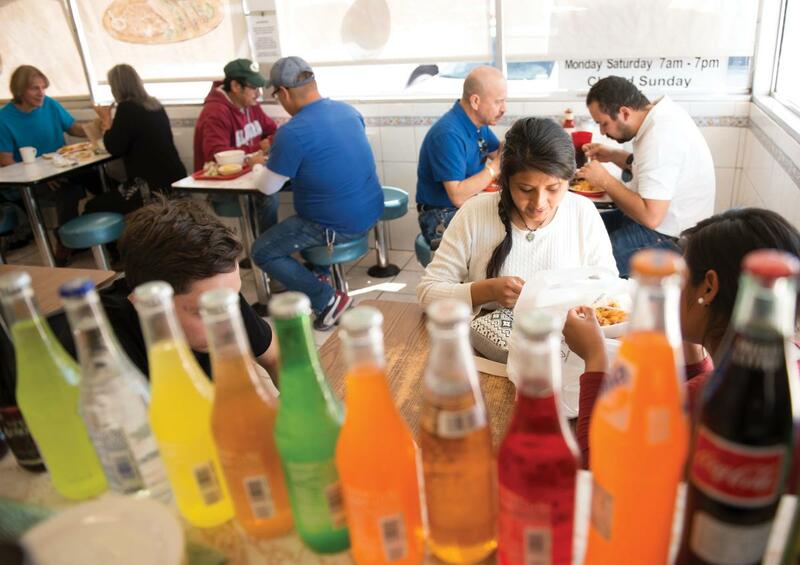 Mexican sodas complement the cuisine at Taqueria Mexico in Albuquerque. When I moved to New Mexico in 1980, I was a little surprised to see Taco Bell flourishing here. For better or worse, it probably helped turn on more folks to a loose version of the snack food. The rise of the food truck in recent decades further brought tacos to the masses throughout New Mexico and all across the United States. Collectively, Americans now devour some 4.5 billion tacos annually, according to the people who track such things. We eat American-style Taco Bell versions and soft classic Mexican ones. The dish claims a national day of celebration (Octo-ber 4, if you want to get a start on your party invitation list). It is marketed with a sticky weekday promotion: Taco Tuesday. Further, the taco cracked the ceiling of popular culture with its own online emoji, and if you need any more proof, I’m sitting here writing while wearing a pair of taco socks. 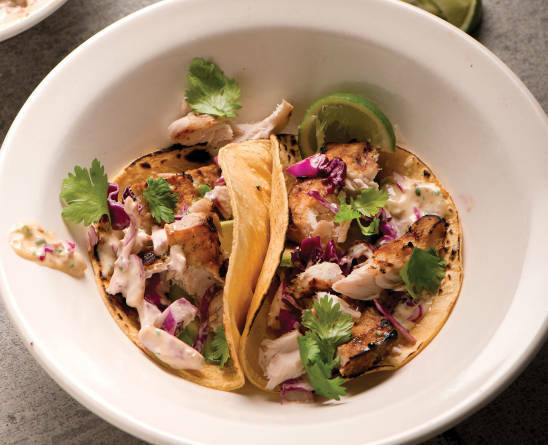 In New Mexico, we prepare tacos à la Mexican classics such as al pastor (spit-cooked marinated pork) and modern mash-ups like chef-created Korean barbecue-and-kimchi tacos. You can find tacos from Albuquerque to Zuni. The taco was not born here, but hey, it got here as fast as it could. New Mexico is all the more delicious because of it. Many vegetarian tacos are as simple as beans or potatoes wrapped in a tortilla. These ones rock it New Mexico style, with our best-loved vegetable sauté filling the tortillas. You can satisfy many a carnivore with these. Warm the butter and oil in a large skillet over medium heat. Add the squash and onion. Sauté for 10–15 minutes, until the squash is well softened. Stir in the corn, chile, and salt. Cover and cook for about 10 minutes more, until all the vegetables are tender. Uncover and cook briefly until any standing liquid has evaporated. Spoon the calabacitas mixture into a bowl and serve along with the tortillas and cheese. Let guests construct their own tacos and enjoy right away. In the mountainous north, where the growing season for fresh tomatoes is limited, this style of salsa has been traditional for generations. It can easily be whipped together, and keeps for 3 to 5 days. Combine tomatoes, onion, garlic, vinegar, and a small amount of chile in a blender and puree. Taste and add more chile as you wish for zip, and salt to taste. Pour into a bowl and refrigerate until needed.